A friend recently asked me what I thought the best instant tents for camping were so I wrote this article and reviewed of 5 of the best pop ups I could find. 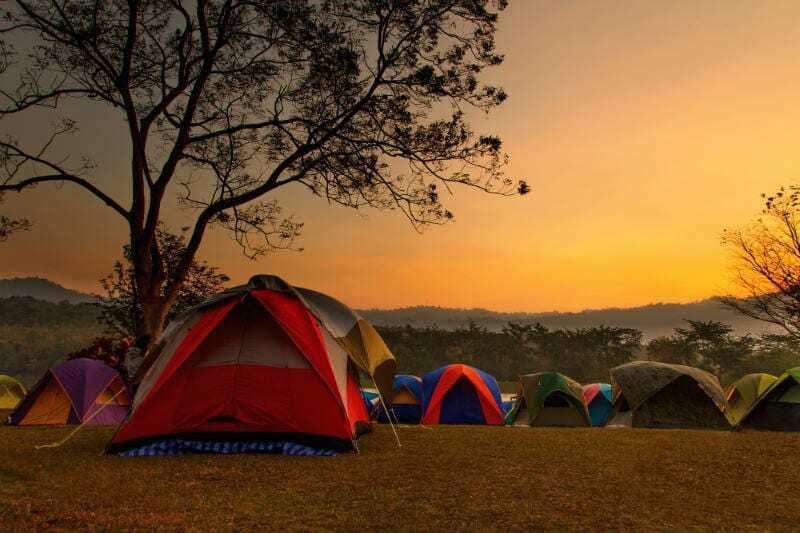 I vividly remember the first time I saw an instant tent. I used to do a lot of budget travelling and this one time my buddy and I arrived at a beach in Kenya and started pitching our old school tent. It was probably the 10th time we’d done it in 10 days so you’d have thought we’d be pro’s. But instead one of us screwed something up and we started growling at one another. At that moment an Israeli guy dumps his backpack next to our pitch, he reaches in, pulls out his tent and literally throws it at the ground. Fooomp! Up it pops. Simple as you like… We were extremely jealous. Perfect starter tent for kids! The Toogh 2-3 person instant tent weighs 8lbs 5oz. This is a 3 person pop up tent with two doors and two windows (which allows for a nice cross-breeze in hot weather). It’s really easy to set up (are you noticing a theme with the setup?!). And it’s remarkably easy to tear down; just like closing an umbrella really. Given how important this is for anyone looking to buy an instant tent, it was actually really difficult to find one that was well designed when the time came to “pop down”. But the guys at Toogh have clearly spent some time and effort working on the problem and the solution is very elegant. I also think that it’s well priced; offering good value for money when it comes to space, stability and durability. And it suits such a wide range of uses you should be able to have a lot of fun with it for a good long time. It weighs in at 7.5lbs which isn’t too bad at all. There’s a cool little porch and loads of accessory pockets inside to help you stay organised. While you could fit 3 people in, it would be a bit tight so I’d definitely bare that in mind before buying it. It’s rated for 35mph winds (which it seems to stand up to) but it will bend in on itself when if the wind gets any stronger. While to me it looks well water-proofed there are a few reports that it can let water in. I’m a bit sceptical of that feedback but it would probably be worth using a proofing spray and a seam sealer just to be on the safe side. It’s a good all-rounder! Perfect for car camping and weekend camping. It would make an awesome festival tent because it’s so nice a roomy. And I reckon kids would love it! (If you have your heart set on a 3 person tent and it doesn't have to be an instant tent, check out a full list of options here). This is two-person tent that pops up quickly and easily. There’s three ventilation windows which means you can get good airflow when needed. Given how lightweight it is, it’s surprisingly sturdy. And it’s a great price. It’s not the most intuitive when it comes to taking down, but TheNORTHBlu do have a video demo and, once you get the hang of it, it’s fairly simple. It will see off a heavy due or a light rain shower, but I wouldn’t trust it in a heavy downpour. And you’ll almost certainly want a tarp if it’s wet underfoot. This makes a great festival camping tent so long as you’re not expecting rain. But provided it’s try you can throw it up, throw your gear inside and focus on the music. It’s also a great one for kids either for indoor camping or backyard camping. It’s really easy for the to put up and is strong enough to withstand their boisterous play. If you are interested in reading about more large cabin tents, check out this article here. This is a spacious 3-4 person tent and weighs in at just five pounds. It’s got a dinky skylight for star-gazing. It also has a silver anti-UV coating which is a nice touch. It’s easy to set up (just toss it and let it snap into place). When folds down (if you can fold it down) it goes into a neat 31-inch circle which you can pop into a convenient carrying case. You really don’t want to get caught in the rain with this. I suspect that even if you do some waterproofing yourself you’ll end up letting water in. Also the floor is a bit flimsy so you’d want to be extra careful about where you pitch it to avoid getting punctures (a tarp is probably a must). Finally it’s really, really difficult to work out how to fold it back up. You don’t want to push anything too hard in case the poles break. Don’t get me wrong, once it’s folded down it’s fantastically portable. But it may take you a while to figure it out! If you’re looking for a spacious pop up and you’ll be using it in a dry place then it’s not a bad choice. However, in my opinion it’s probably more ​backyard camping than camping ​camping . It’s a 4-person tent with large openings on both the left and right sides for easy access. There are also two large windows with two smaller windows underneath, and these mesh openings are covered by a durable nylon flap that helps to protect your privacy while providing great ventilation. You can keep the interior neat and tidy with the small storage pouches dotted around the interior. It’s tent is easy to set and when you break it down, you have a light, durable carrying case to store it in. There’s no way it’s actually useable for 4 adults. You might comfortably fit 1 adult and 3 kids but it’s definitely not as spacious as it makes out to be. That said, it’s comfortable for 2 grown ups. As with a couple of the tents I reviewed for this piece, the tear down is more complicated than it needs to be. But practice will make perfect. The tent is coated with a water-resistant material but even though it zips up neatly, there’s no dedicated rain fly so it’s not suitable for heavy rain. If you want a solid summer tent that’s going to last a good long time, this is a good choice. You’ll be able to roll it out for touring, car camping, festivals and backyard camping. This is a heavy-weight, 4 person pop up. You’re not going to worry about blowing away in this. It’s got good quality seams and the makers haven’t scrimped on the zippers in a way that so often happens at this price point. Add to that windows that have options both for ventilation and privacy and it starts to feel like a pretty well-designed piece of gear. As with most tents, don’t believe the hype when they talk about the size. You’re not going to fit 4 full grown adults in here without some discomfort. And it’s also not rated for heavy rain. I also thought that at nearly 10lbs the weight started to outweigh the benefits of durability (unless you’re car camping). So long as you don’t have to walk far with it, if you’re looking for a larger pop up tent then I’d choose this one over the Zomake or the FiveJoy because it feels more robust. I probably wouldn’t recommend it to a budget traveller though. Some people enjoy the ritual of making camp but a lot of folks just want a place to sleep. Kids and first time campers may want to enjoy the experience of sleeping outdoors rather than the routine of setting up. And that’s where the best ​instant tents can make camping so easy because you really just have to throw the tent to the ground to have shelter. And they aren’t just simple to set up, they’re also easy to repack. All you have to do is fold it into a coil shape and slide it into its carry sack. It really is that simple (check out this video). Because most ​instant tents are almost entirely self-contained, and this means there’s less chance of losing pieces during set up and tear down. So if you’re the kind of person who hates fiddly bits or loses things easily, this will vastly simplify your camping experience. When it comes to overall weight, it's hard ​they are hard to beat. The heaviest tent I reviewed for this article is 10lbs and most of them sit around the 5lbs mark. I personally wouldn’t use an instant for camping in the wilderness or in really extreme weather. ​They tend not to be highly technical from a wilderness perspective and I’d always want the security of having a tent that has been specifically designed for wilderness camping if that’s what I was doing. But where ​they come into their own is for things like backyard camping, budget travelling, kids camping and festivals. This flexibility is part of the reason ​they're ​so popular and my reviews aim to reflect the wide-ranging uses (as well as budgets). 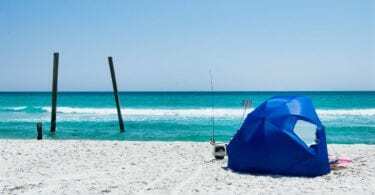 You want your pop up tent to last through all of your adventures, and spending a little more upfront is usually the most sure-fire way to get a more durable tent. You should also take into consideration where you'll be using it the most and what kind of terrain you'll be pitching on (I really wouldn't recommend ​pitching on ​really rough ground or weather). You want to be able to easily transport your tent. Especially if you're travelling you want a tent that stores small and doesn’t weigh too much. If you’re car camping or backyard camping, this probably isn’t such a big deal. But you want to think about where you want to make compromises. I wouldn’t personally pay more than $200 for an ​instant tent. There’s a lot of good brands that sell for under $100. And when traditional tents often run to the upper hundreds, that means ​these guys are sold at the cheaper end of the market. I think the main reason for this is that they aren’t intended for really heavy use. So buying a decent ​one is unlikely to break the bank. 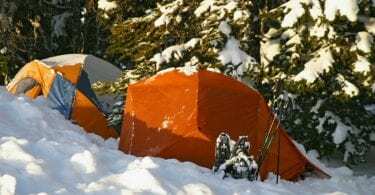 But if you are planning to use it a lot, you’ll probably want to either plan to replace it within a couple of years, or consider buying a traditional tent.